In the last decade the pitbull was seen as the badest, meanest breed of dog. Wrong! There are dogs that will wipe the floor with any breed of pitbull you can get. But that’s not the point here. A 30 kgs pitbull can be easily put down by a man who doesn’t fear dogs… but how about a 100 kg Caucasian Shepherd? 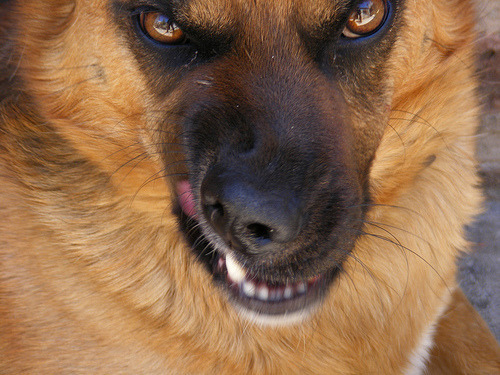 So, if you want your home defended, here is a list of the Top 10 Badass guard dogs. This breed has a personality marked by direct, fearless willingness to protect human children. The dog must be approachable, quietly standing its ground and showing confidence and willingness to meet overtures without itself making them. It is poised, but when the occasion demands, eager and alert; both fit and willing to serve in its capacity as a companion and watchdog. In the hands of a responsible owner, a well-trained and socialized Rottweiler can be a reliable, alert dog and a loving companion. However, any poorly trained dog can become a danger in the wrong circumstances. 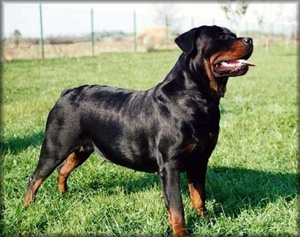 The Rottweiler is a steady dog with a self-assured nature, but early socialization and exposure to as many new people, animals, and situations as possible are very important in developing these qualities. The Rottweiler also has a natural tendency to assert dominance if not properly trained. Rottweilers’ large size and strength make this an important point to consider: an untrained, poorly trained, or abused Rottweiler can learn to be extremely aggressive and destructive. The Great Pyrenees (Pyrenean Mountain Dog) is a capable and imposing guardian, devoted to his family, and very wary of strangers. Males weigh in at about 100-160 pounds (45-73 kilograms), and when not provoked it is calm and somewhat serious. Courageous, very loyal, and obedient, devoted to family even if self-sacrifice is required. During World War II the dogs were used to haul artillery over the Pyreneean Mountain range to and from Spain and France. 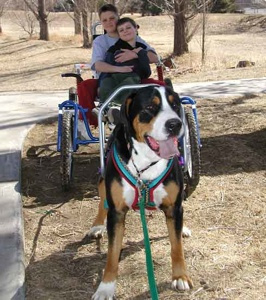 The Greater Swiss Mountain Dog is a large, muscular, tricolour (black, rust, and white; typically with a white blaze) dog. Males should weigh around 60 – 70 kg the height is 65 – 72 cm at the shoulders. Swissies have a very strong pack instinct. 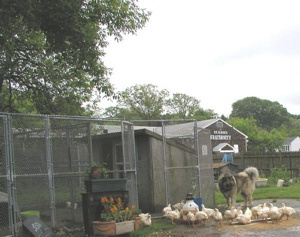 They are protective of their family and training is important for them to learn their place. They want the pack to be together and gets distressed when a member wanders off. After World War II, breeders in Moscow wanted to create a watchdog that would be particularly receptive to spoken orders. 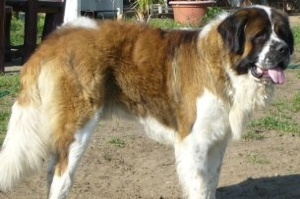 They took the Caucasian Ovtcharka (caucasian shepherd) – possessing wariness and ferocity, and the Saint Bernard – a larger breed with a gentle temperament, and now, over fifty years later, the Moscow Watchdog possesses the mental and physical attributes desired by the original breeders. 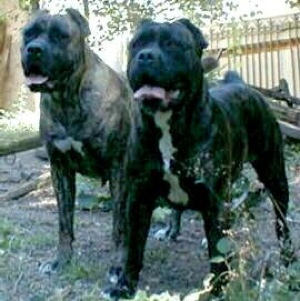 The Boerboel, the only breed of dog solely and specifically bred to defend the homestead. The dog should give the overall impression of immense substance, strength, power, and physical ability, and should be able to more than amply demonstrate this in his day to day work. Boerboels are a very dominant but intelligent breed, with a strong watchdog instinct. They are self-assured and fearless, but responsive to the needs of the family displaying an intuitive ability to sense if the family is in danger. Like other large dogs with a strong guard instinct, the Boerboel needs to be watched around strangers always, and introduced to friends and other dogs early on to avoid aggression, and like all dogs should never be left with young children unattended. 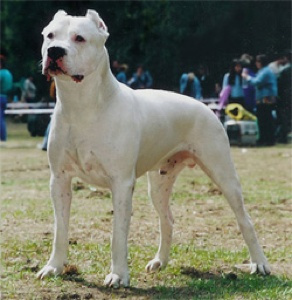 The Dogo Argentino or argentinian mastiff, is a large, muscular and athletic white-coated dog with an unusual history. They are excessively tolerant of children due to their high pain tolerance, derived from selective breeding to be big game hunters. They are protective of what they perceive as their territory and will guard it without fear against any intruder. The minimum height for the male is 62 cm (24.3 inches). 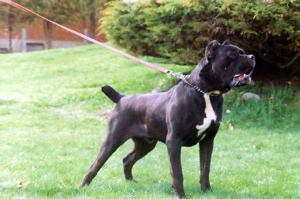 The Cane Corso is a medium-large guard dog native to Southern Italy. 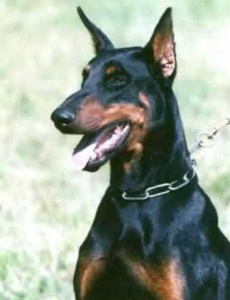 Its stable temperament and powerful body make him particularly valued as a guard dog and protection dog. Traditionally, rural Southern Italy has always used this rustic type of dog for the hunting of big game and for guard and protection work. These dogs were known under various regional names: Vucciuriscu (or Bucciuriscu) in Sicily, Cane della masseria in Puglia, Cane da Macellaio (Butchers Dog). The official FCI standard calls for dogs to stand from 60-68 centimeters at the withers (23.6-26.7 inches). I’m a dog owner and breeder, and I tell you, if you have a place (house, yard, facility) to protect, This is the dog you need. Excessive softness or vicious temperaments are considered serious faults for the breed some say, but if you really want the bigest, meanest dog around, he’s the one. This breed is very rustic and adapts quickly to every climate. 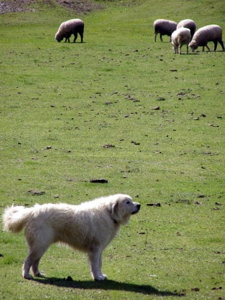 The Caucasian Shepherd is well adjusted and active. However, he is highly suspicious of strangers, and he may become aggressive. The Wolfdog. Half wolf, half some large shepherd breed. Vicious, hard to train, eats a lot, not very a very loving pet, but who would dare break into your home when you got wolves in the back yard? 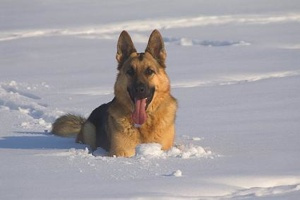 The dog pictured above is a Wolf-German Shepherd cross. 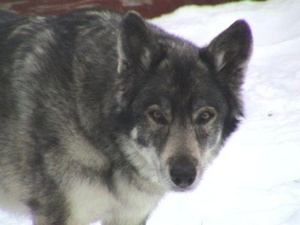 I have to agree with Jo about the temperment of the wolfdog (wolf-hybrid). My first wolfdog would have probably either snuck off to a corner or pointed out the really good stuff to them depending on if they were male or female and whether they offered her a piece of pizza or a chunk of steak. On the other hand, when someone threatened me personally, I had to restrain her to keep her from taking their throat out. It all depends on the dog and the situation. And people need to remember, a dog is never going to be able to protect you from someone who has a firearm and is serious about doing you harm or taking your stuff – they can sound the alarm, but then they need you to back them up. I have been raising akitas for the past 20 years and can tell you there is no better guard dog. They do not bark incessantly or at every little noise, and when they do there is a reason for you to pay attention. They were originally bred for bear hunting and imprint on their family to a nearly mythological level. If you want an intelligent breed of dog and something which will deter threats just by sight then an Akita is your best bet.